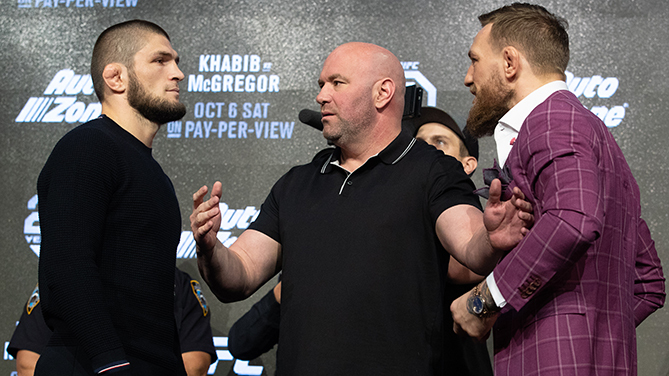 Khabib Nurmagomedov (L) and Conor McGregor (R) face off after the UFC 229 press conference at Radio City Music Hall on September 20, 2018 in New York, NY. The two will meet in the main event on October 6, 2018 at the T-Mobile Arena in Las Vegas, Nevada. (Photo by Ed Mulholland/Zuffa LLC via Getty Images) " align="center" />Two events on opposite sides of the continent, separated by two weeks; one in a familiar locale and the other a first-time stop. October’s UFC schedule is light on events, but it’s not short on compelling matchups as the return to Las Vegas for this coming weekend’s UFC 229 Pay-Per-View and the maiden trip to Moncton, New Brunswick each offer a collection of quality fights and intriguing pairings. While the former is certainly more high profile than the latter, both offer up a handful of competitors to watch as the year winds down and the blueprint for 2019 takes shape. There is a little bit of everything on tap between these two cards, and once the smoke clears and the dust settles, there will be a handful of divisions that could look different and a bunch of fighters who may have established themselves as serious contenders heading into next year. Here’s a look at the most intriguing and exciting matchups on the schedule for the month of October. This month’s “Prospect vs. Veteran” clash opens the televised portion of the UFC 229 prelims and carries a ton of significance in the bantamweight division. Evinger suffered a knee injury last year and is just now set to make her second appearance in the Octagon after challenging Cris Cyborg for the featherweight title last summer at UFC 214. “Triple Threat” survived into the third round before getting finished, but further solidified her standing as one of the toughest outs on the female side of the roster in the process. Arriving in the UFC with a 5-0 record and a ton of promise, Ladd looked good in her promotional debut, rallying from a sluggish first round to finish Lina Lansberg in the second last October in Gdansk, Poland. She was scheduled to compete back in April, but her bout with Leslie Smith was scuttled at the last minute after Ladd failed to make weight. This is a serious step up in competition for the 23-year-old Ladd, but also a tremendous opportunity as well. Evinger had gone unbeaten in her previous 11 bouts prior to facing Cyborg and is one of the most seasoned, savvy and respected fighters in the division, so a victory could catapult the MMA Gold product into the title conversation, while a loss would simply prove she still needs a little more seasoning before joining the division’s elite. While the prevailing thought has been that Henry Cejudo’s ascent to the top of the flyweight division has given the collection of contenders in the 125-pound weight class new life, that might not be the case for the two elite talents who square off on Saturday night in Las Vegas. Pettis and Formiga face off in the penultimate preliminary card bout of the evening and although it is an exciting contest between a pair of legitimate contenders, both have already shared the cage with the new champion and came out on the wrong side of the results. In the three years since he faced Cejudo, Formiga has gone 3-1 and enters Saturday’s contest on a two-fight winning streak where he earned a pair of finishes. 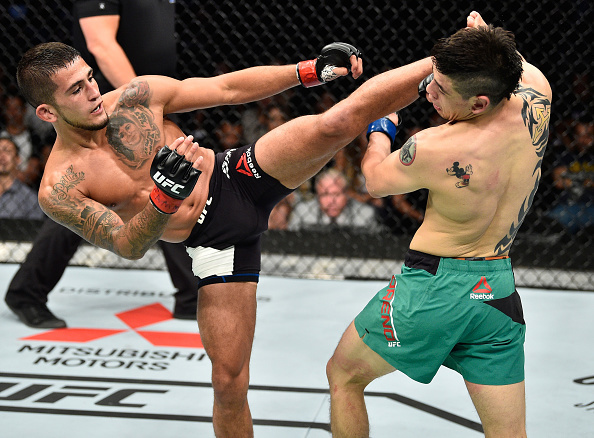 As for Pettis, he rebounded from his UFC 218 setback against the new champ with his biggest win to date – a split decision victory over perennial contender Joseph Benavidez in June. Both are within arm’s reach of a title shot and a victory for either would only serve to strengthen their case, making this a must-win for each man. Will Pettis be able to keep it standing and avoid tangling with the talented Brazilian on the canvas or will the smothering Formiga neutralize his striking attack and force him to tap? Announced just over a week ago, this welterweight contest in the middle of Saturday’s televised prelims is incredibly compelling to me. Turner is someone people who follow the sport intensely have been hearing about for a couple years now, either from his time getting in rounds at Jackson-Wink MMA or his work with former middleweight champ Michael Bisping and the crew at the RVCA Gym. This past summer, “The Tarantula” made an appearance on the Contender Series, earning a first-round stoppage win over Max Mustaki following the opening five minutes of a fight he was thoroughly dominating. Having now won three straight and five of his last six, the tall, long lightweight moves up to the 170-pound weight class for to face Vicente Luque in hopes of making a further impression on the UFC brass and announcing his arrival on the biggest stage in the sport in style. Luque is one of those guys who has somehow managed to stay under the radar in the packed welterweight ranks despite the fact that he’s earned back-to-back stoppage wins over Chad Laprise and Niko Price and collected six finishes in his last seven fights. The 26-year-old Brazilian has knockout power coupled with a deft submission game and is just now hitting that point of his career where no one would be shocked if he took another giant leap forward to become a factor in the division. This is one of those fights that has the potential to be a pivotal contest in the careers of both men and potentially turn some heads on Saturday night at T-Mobile Arena. This one is intriguing and important on a number of levels. First, Lewis is looking to extend his winning streak to three and move to 9-1 in his last 10 fights, but he’s also keen on making up for his poor showing – in victory, mind you – against Francis Ngannou at UFC 226. Secondly, with Volkov sporting a perfect 3-0 mark in the Octagon and coming off a win over former champ Fabricio Werdum, there is a very real possibility that these two are fighting to be the No. 1 contender in the heavyweight division or perhaps a date with Stipe Miocic once the recently dethroned Cleveland native is ready to return to action. And lastly, they’re heavyweights, so while Lewis himself proved that you can’t always count on the big boys to sling serious leather every time they step into the cage, it’s safe to say that was an off night for “The Black Beast” and that he and “Drago” will most likely launch produce more offensive output in the opening three minutes of this fight than Lewis and Ngannou combined to deliver back in July. This main card attraction has a little “Prospect vs. Veteran” feel to it, except because it’s taking place in the light heavyweight division, it’s also a battle of ranked fighters looking to solidify their standing in the wide open 205-pound weight class. 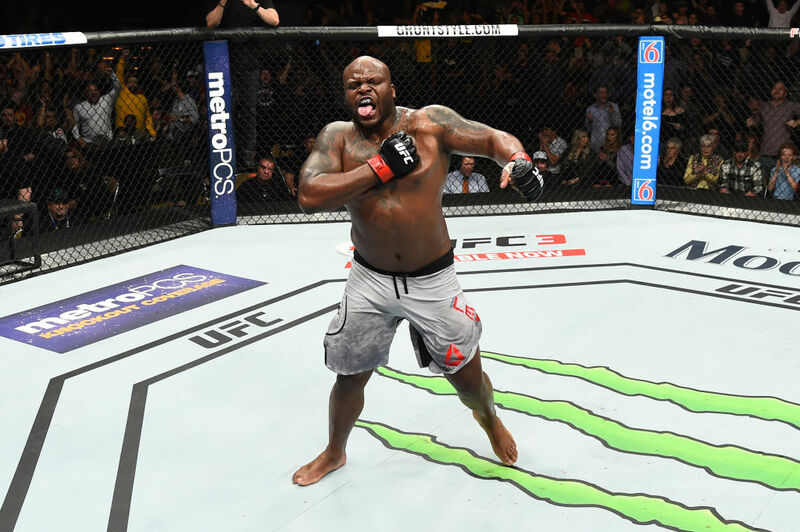 “OSP” is making his 18th appearance in the Octagon and enters off a first-round submission win over another promising, young talent, Tyson Pedro, last time out. A fixture in the Top 10 for the last several years, Saint Preux has an awkward style and diverse offensive arsenal and is a considerable step up in competition for the surging second-year man Reyes. A former collegiate football player, Reyes went 3-0 in the Octagon during his first year on the roster, earning a trio of stoppage wins to push his record to 9-0 overall. The 28-year-old has yet to see the second round in the UFC and if he maintains that streak through this fight with Saint Preux, he will enter 2019 on the cusp of title contention and carrying a considerable amount of buzz. The main event isn’t the only crucial lightweight contest set to take place at UFC 229. Five months after a knee injury put him on the sidelines, Ferguson returns in hopes of once against establishing himself as the No. 1 contender in the 155-pound weight class. Standing across the cage, hoping to do the same, will be former champion Anthony Pettis. Not only did Ferguson’s most recent injury wipe out another scheduled bout with Khabib Nurmagomedov, but it also opened the door for fighters like Dustin Poirier to bolster his case for being next in line for a lightweight title shot. But thanks to his Wolverine-like healing abilities, “El Cucuy” is already back in action and if he can push his winning streak to 11 on Saturday night, the conversation about who’s got next will get a little more complicated. There are no guarantees that the winner of this one will be in line for a title shot, as the top of the lightweight division is crowded and complicated to sort out, but with the potential there and neither man interested in losing any ground, don’t be surprised if Ferguson and Pettis pull out all the stops when they hit the Octagon on Saturday night in Las Vegas. What more is there to say about this fight that hasn’t already been said? Not only is it a battle between the unbeaten champion and the returning former titleholder, but it’s also a first-rate grudge match and arguably the most anticipated fight in UFC history. What makes it so compelling – at least to me – is that there are myriad ways this fight could play out and none of the possibilities seem unlikely. Either man could finish early or rally down the stretch as the other starts to fade. It could be a one-sided drubbing in either direction or an absolute crackerjack of a fight that exceeds expectations and goes immediately into the history books as one of the best bouts in UFC history. It could be looking like a lopsided affair only to shift on a dime and move completely in the opposite direction. None of those outcomes are hard to envision and unlike most fights, they’re all realistic possibilities. The energy inside T-Mobile Arena as these two start making their way to the Octagon is going to be off the charts and my guess is that the fight itself will end up exceeding the already-high expectations. Get ready for a classic. Every month there is at least one fight that makes an appearance in this series strictly because I’m exceedingly interested in seeing one half of the pairing and this is this month’s example. With all due respect for the debuting Madge, I’m here to see Te Edwards. The charismatic MMA Lab product made quick work of Austin Tweedy earlier this year on the Contender Series, putting him down with the first real right hand he threw to earn his fifth consecutive victory and collect himself a UFC contract. While lightweight is loaded with talent, the 28-year-old has shown he has quick, powerful hands, plus he wrestled at ODU and Arizona State, and coming from the John Crouch-helmed gym in Glendale, Arizona, you know he’s going to be in good shape and ready to compete on a nightly basis. Hailing from Cape Town, South Africa, Madge arrives on a four-fight winning streak capped by a second-round stoppage win over tough veteran Dave Mazany in his last appearance under the EFC banner. Injuries have kept him on the sidelines for the last 18 months, but the 28-year-old “Magic Man” has a chance to make an instant impression by halting Edwards’ rise before it ever really gets started. Checking in on new arrivals to one of the deepest, most competitive divisions in the sport is always a worthwhile venture and something tells me the winner of this one will turn some more heads in 2019 as well. Riding a seven-fight winning streak that includes six finishes, Cage Warriors lightweight champ Fishgold arrives in the UFC and immediately moves down a division with a chance to impress in a tough pairing against Kattar. The 17-1-1 Fishgold successfully defended his title three times and has only gone the distance four times in 19 bouts, which includes wins over TUF 22 contestants Marcin Wrzosek and Nic Herron-Webb. Stepping into the Octagon for the first time, the Liverpool native is getting a stern test right out of the gate in the Maritimes as he steps in against the talented New Englander. Kattar suffered the first loss of his UFC career in April, dropping a unanimous decision to Brazilian standout Renato Moicano after registering wins over Andre Fili and Shane Burgos. Part of the growing crew of Boston-area fighters who have banded together, including Rob Font and Kyle Bochniak, the 30-year-old has smooth, technical boxing and toughness for days, which not only makes him a difficult opening assignment for Fishgold, but a pain for just about anyone in the division. While it’s not the most high profile fight on the card as the UFC makes its first visit to Moncton, it wouldn’t be surprising if this one ended up earning Fight of the Night honors. 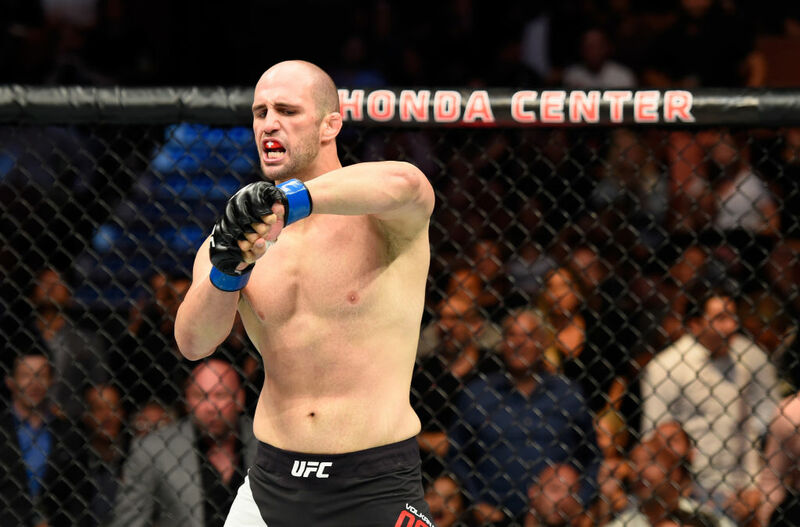 If people still aren’t sold on Smith being a legitimate new threat in the light heavyweight division, this one should help answer whatever questions remain because Oezdemir is the real deal and the winner of this one will be in the thick of the title chase in the 205-pound weight class. After earning three wins in six months over a trio of Top 10 opponents to begin his UFC tenure, Oezdemir challenged Daniel Cormier for the light heavyweight belt in Boston at UFC 220 and was shown the difference between being an excellent fighter and a truly world-class talent. Now the man known as “No Time” wants to make up for lost time by shutting down Smith’s rapid rise and keeping himself front and center for when things get rolling again at the top of this division. A former middleweight journeyman, Smith moved up to light heavyweight following his loss to Thiago Santos in February and quickly beat former champions Rashad Evans and Shogun Rua to establish himself as someone to watch in the division. Many have dismissed his success as simply a case of the younger, faster, stronger newcomer taking on fading names at the end of their career, but “Lionheart” was always a durable, dangerous out in the 185-pound ranks and it shouldn’t surprise anyone that he has moved up a division to become a formidable threat. He’s been eager to face anyone and everyone, and this main event assignment in Moncton should provide some clarity as to whether Smith is a bona fide contender or not. For the record, I’m convinced that he is and think he’ll prove it here, regardless of the outcome.